It’s your basic pub restaurant with the usual types of food- steak, burgers, fish & chips, pizza, beer, etc. It was actually $6.99 pizza night, so we both ordered one. My choice was the Steak & Mushroom. It was decent. It had a thin crust, but the middle part seemed to be soggy. There was an abundance of topping though, with lots of mushrooms and steak pieces. It was very tasty despite the soggy parts. 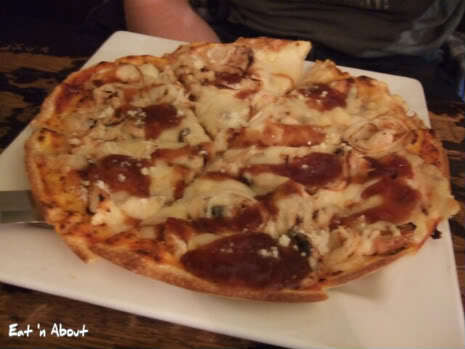 My friend ordered the BBQ Chicken pizza. It was slightly spicy and the chicken pieces were a bit dry. 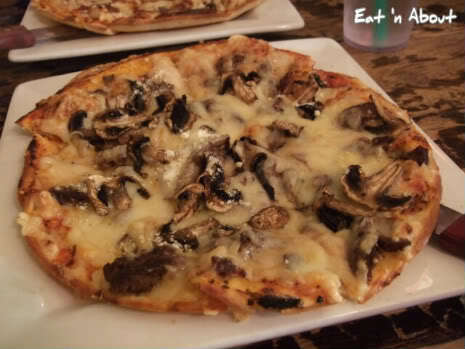 But again there is quite a bit of toppings and it wasn’t bad but we definitely preferred the Mushroom & Steak better.